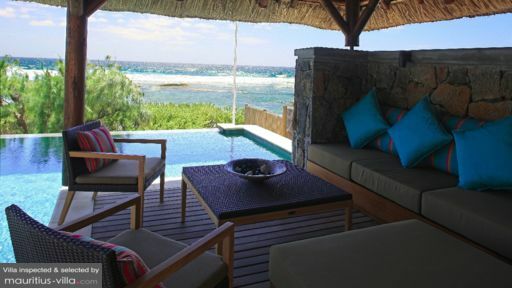 Villa Dunes 2 is a vacation residence facing a remote, white-sand beach on the northern coast of Mauritius. The villa is an epitome of rustic chic as it showcases a fusion of rural architecture with stylish and complementary woven-wood appointments as well as modern amenities all offering utmost comfort and convenience. Partially concealed from the outside by a thicket of bushes and shrubs, Villa Dunes 2 truly serves as your exclusive and private seaside hideaway. The villa has three bedrooms – all on the second level. The master bedroom has a double bed and a panoramic view of the open sea. The second bedroom also has a double bed. The third bedroom has twin beds. Each bedroom has a dedicated bathroom. The focal point of the property’s outdoor area is the seven-meter infinity pool. Here, after getting your saltwater fix, you can continue your communion with the water as the pool’s edge seems to seamlessly flow to the vast ocean. You can also resume your sunbathing earlier at the shore on the cushioned, rattan pool beds on the wood-decked covered terrace. Once the temperature rises, you can opt to sit back on the large cushioned couches and chairs under the shade of the poolside gazebo. From the covered terrace, framed glass sliding doors lead you indoors to the living area. On large and long cushioned couches oriented towards a widescreen TV, you can all sit around for the much-awaited latest episode of the newest hit series. Or, to experience, once again, the unforgettable high points of your most-beloved classic film. Right behind the living area is the indoor dining area with its long, wooden table good for 10. Here, you can sample authentic Mauritian – as well as international – cuisine masterfully prepared by the resident chef at the fully-equipped, ultra-modern kitchen set up in a separate room. On the covered terrace is an alfresco dining area should you prefer to have lunch by the beach or dine out on breezy evenings. On duty to oversee the villa’s regular services is a staff made up of a gardener, a pool attendant as well as housekeepers. Aside from the in-house chef, a babysitter and a spa therapist may be called in upon your request. Engaging their services, however, come with a separate charge. Your stay at Villa Dunes 2 wouldn’t be complete without a day tour around the village of Grand Bay or Grand Baie within the District of Riviere Du Rempart. Include in your itinerary not just a swim in the enchanting emerald waters but aqua sports, deep-sea fishing and island hopping at neighboring Gunner’s Quoin, Flat Island, Round Island and Serpent Island as well. Also known as a top shopping destination, Grand Baie has a wide array of shops and stores with a myriad of clothes, crafts, jewelry, souvenirs and textiles for sale. After dark, party and dance the night away at hip, “in” places such as Banana Café, Zanzibar, Les Enfants Terribles and Buddha Bar.